The character of Venom was initially meant to be an adversary to Spider-Man. Now the popular Marvel Comics villain – who was played by Topher Grace in Sam Raimi’s 2007 blockbuster Spider-Man 3 – takes centre stage in the aptly titled Venom, and I’m honestly not exactly sure what to make of the results. Part of Sony’s latest attempt at building their own shared superhero universe, Venom has gotten a bit of a reputation as a campy, so bad it’s good sort of film since its release in October. And it is mildly entertaining to watch at times, but it’s also a noisy, mindless mess that struggles to nail down a consistent tone throughout. The film follows Eddie Brock (Tom Hardy), a guerrilla reporter who hosts a popular web series and seemingly has it all, living in San Francisco with his fiancée Anne Weying (Michelle Williams), a powerful attorney in her own right. But his life and career are destroyed when he goes up against Carlton Drake (Riz Ahmed), the CEO of a bioengineering corporation called the Life Foundation that Anne’s firm is representing, and confronts him about the company’s unethical research practices during an on-camera interview. Six months later, Brock is contacted by Dr. Dora Skirth (Jenny Slate), who works at the Life Foundation and wants him to do a followup story exposing the fact that Drake is currently in the process of trying to morph alien symbiotes with human hosts, and using homeless participants for these experiments. When Brock goes to the lab to gather evidence, he gets infected by one of the symbiotes, a shapeless black blob that needs to morph with a living being in order to take form and survive. And thus, Venom is born, giving Brock a powerful alter-ego with a penchant for biting off human heads. Working from a script by Jeff Pinkner, Scott Rosenberg and Kelly Marcel, director Ruben Fleischer mixes elements of action, comedy and body horror, while never quite fully embracing any one of these things. The film isn’t deep enough to work as a character study, so it almost entirely misses its mark in terms of presenting its central character as a nuanced anti-hero, and there is no hero for him to play off of in order to make him a compelling villain. While Carlton Drake could have made for an interesting adversary, he is instead presented as a slithering, one-note bad guy who is evil right from the start. The main selling point of Venom is Tom Hardy’s gonzo, over the top performance, and it is a sight to behold. The actor throws himself into the role in a way that is often amusing to watch, channelling the sort of character that Jim Carrey would have played in the 1990s. As Venom takes over, Eddie is left talking to himself while conversing with the thundering voice in his head – which makes increasingly ridiculous demands – and Hardy embraces the physical aspects of the role, whether throwing himself around his apartment or climbing into the lobster tank at a restaurant. It’s a performance that hails from the Nicolas Cage school of acting, and there is some fun to be had in seeing an actor of Hardy’s caliber taking on a role like this, making it possible to enjoy Venom in an ironic sort of way. The romantic scenes between Eddie and Anne are cheesy and laughable, the dialogue is clunky, and the special effects often look dated, adding to the campy feel of it all. At times it does seem like the filmmakers were going for a self-parodying tone, à la Deadpool, but it doesn’t always work. The film often falls into the curious middle ground of not being good enough to warrant a serious recommendation, while also not quite being bad enough to enter so bad it’s good territory. What we are left with is a mildly amusing time waster, with a handful of meme-worthy scenes here and there, that overall feels like little more than a hot mess. The film also makes the altogether odd choice of gong to credits a full twenty minutes from the end of its close to two hour running time, culminating with an extended clip from Sony’s far superior animated film Spider-Man: Into the Spider-Verse. 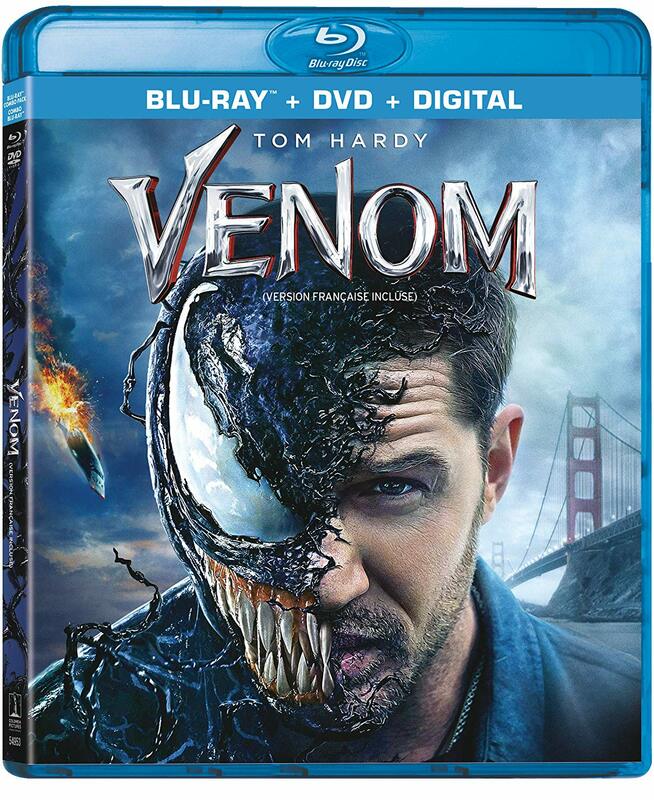 The Blu-ray also includes the option to watch the film in Venom Mode, featuring pop-up trivia, as well as a trio of deleted & extended scenes (Ride to Hospital, Car Alarm and San Quentin Extended), and the six surprisingly informative featurettes From Symbiote to Screen, The Anti-Hero, The Lethal Protector in Action, Venom Vision, Designing Venom and Symbiote Secrets. There are also animated storyboards for several of the set-pieces. Finally, the disc includes the music videos for “Venom” by Eminem and “Sunflower” by Post Malone and Swae Lee from Spider-Man: Into the Spider-Verse, as well as the option to watch the extended Spider-Verse clip from the end credits on its own. Venom is a Sony Pictures Home Entertainment release. It’s 112 minutes and rated 14A.